Turn a knob, flip a switch to a promising future creating cutting-edge consumer electronics. Consumer electronics encompasses a wide variety of devices. They include those that provide home entertainment such as TVs, communication devices such as smartphones and tablets, home office devices such as laptops, printers and paper shredders, and electronic musical instruments. Engineers design and build those devices and improve on their quality. The engineers profiled here work on making certain their companies - Dell, HP Inc., Sony, Lenovo and Plantronics - provide the best products for the home consumer. A computer engineering graduate, Roslyn Jones’ participation in several university-level STEM programs - where she heard technical professionals speak about the creativity and inventiveness inherent in their jobs - sparked her interest in both computers and engineering. She’s currently a graduate student in the Master of User-Centered Design program, a graduate program supported by Dell Inc. It was “a genuine interest in the customer,” something that Jones feels should be the number one priority in a business, that drew her to a career in consumer electronics. “Without the customer, there is no business!” she maintains. Dell Inc., a part of Dell Technologies and its 140,000 employees, and headquartered in Round Rock, TX, is a multinational computer technology company that develops, sells and supports products such as desktop and laptop computers, 2-in-1s, workstations and monitors. Its strong customer focus and technologically innovative atmosphere aligned perfectly with Jones’ goal of providing exceptional products to ensure great user experience. The master’s degree she’s pursuing will enable her to better grasp consumer behaviors, thought processes and considerations when purchasing a product. Her first experience with Dell came as a summer intern working in an analyst role, about which she learned through her college’s career services department following the completion of her junior year. After successfully completing her internship, and with a computer engineering degree in hand, she was hired into Dell as a full-time software engineer. Although she’s been in this position less than two years, Jones can look forward to a long and successful career at Dell. In the future she can follow a technical track and, after gaining strong coding and analysis experience, become a principal software engineer. She could also choose to take a management route and, with management training, become a program manager. Jones sees Dell as an innovative, customer-focused company, one that also focuses on diversity, all of which appeal to her. To that end, she points out that Dell has several employee resource groups (ERGs) that provide employee development, networking and community service opportunities. “I’ve received many opportunities for professional mentoring and development,” Jones says. Guidance and training were provided by her mentor via the Black Networking Alliance (BNA), which is a Dell ERG. The advice she’s received, she says, has increased the variety of skills she’s able to apply to different positions within the company. 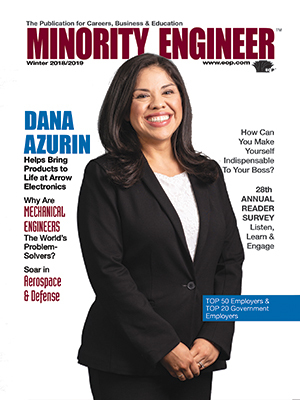 She also credits Women of Color (WOC), a Dell initiative that helps recruit, retain, develop and promote women of color by providing opportunities to develop technical, administrative and tactical skill sets. However, seeking advice and support from her manager, mentors and other confidants helps her maintain her equilibrium and keeps her from becoming overwhelmed. The advice provided by one of the leaders at Dell, that it’s better to be respected than to be liked, is also important to Jones. “It encourages us to maintain our authenticity and path,” she explains, adding that, in a career there will always be challenges and people who won’t like you. More information about Dell can be found at dell.com; open positions are posted on job sites such as Indeed, LinkedIn and Fairygodboss. Connect about #LifeatDell on Facebook, Twitter, LinkedIn, Instagram, Glassdoor and YouTube. Prasanna Modem’s interest in consumer electronics began, early in her career, with a job at a research and development entity for Sharp Electronics. Her work focused on consumer products there. This was after an internship at a measurement insights company, which, she says, gave her much-needed hands-on experience and helped her get a foot in the door when she was offered a full-time position with the company upon finishing her degrees. She then headed into the cable television industry as a software developer, architect and manager before joining HP. “I’ve always been drawn to figuring out how things work,” Modem explains. Thus, a career in engineering seemed right for her. Modem earned an undergraduate degree in electronics and communications engineering in Hyderabad, India and a graduate degree in computer engineering when she came to the U.S. She’s had other work experiences prior to coming to HP, including owning her own small, home-based, start-up company. “My journey focusing on advanced technology continues in my current role as a firmware engineer for HP’s 3D printing business,” she says. The Palo Alto, CA-based global technology company, which has 49,000 employees, develops personal computers and printers, as well as 3D printing solutions. Friends of Modem’s who were former HP employees spoke highly about the company and its culture, convincing her to apply online. In her role as a firmware engineer in HP’s 3D printing firmware group, she’s part of the firmware development team working on the company’s cutting-edge Multi Jet Fusion 3D printing technology. Modem also has the chance to map a career path that best suits her passions, and can look forward to continuing to explore future growth opportunities with the company. Throughout her career, Modem has been advised to aim high and pursue her career goals with a passion. She adds her own advice to be confident in your abilities, gain as much knowledge and experience as possible in college, and proactively seek opportunities for internships and networking. She adds that the company “values diversity and inclusion in all rungs of the organization,” providing exciting career opportunities, particularly for women and minorities. Additional information about the company and its open positions are available at hp.com and hp.com/jobs. Connect on Facebook and Twitter at HP Careers. Both Hoda Sayyadinejad and Praggya Garg work at Sony Electronics, a leading provider of TVs and home theaters, video cameras, audio equipment, cell phones and tablets for the home consumer market. The company, with 91,100 employees and headquarters in San Diego, CA, engages in R&D, engineering, sales, marketing, distribution and customer service. Sayyadinejad, who has undergraduate and graduate degrees in computer science and an advanced certificate in web and mobile application development, is an application engineer. Garg, a manager in QA engineering, earned her bachelor’s degree in software technology and systems management in India and her MBA in international management in New Zealand. One of Sayyadinejad’s two internships, which she did at Sony as a contractor, prepared her for the work she’s currently doing. Now as an application engineer - her first full-time position with the company - Sayyadinejad works with the Sony visual products of America team. “I work with third-party application developers to make sure Android apps pre-installed and promoted by Sony are perfectly qualified to be on our platform,” she explains. Garg originally came on board at Sony Electronics in the role of software quality assurance (QA) engineer, responsible for testing overall software functionality on Sony TV and related products. She’s now part of the same Sony visual products team as Sayyadinejad. “I manage the software quality assurance on TV and home entertainment products for the North America region. My team and I are responsible for the overall software performance on these consumer electronics,” Garg says. She participates in Sony’s Women Unlimited program, which helps her build on her strategic leadership and management skills, and in its women’s networking program called WAVE. “I’m also of member of Athena, a professional association dedicated to advancing women in STEM,” adds Garg. Both women say their interest in consumer electronics is primarily a result of their curiosity about and passion for technology. For Garg, it was also curiosity about new technology relating to products that are part of people’s day-to-day lives. Sony Electronics, a subsidiary of Tokyo, Japan-based Sony Corporation, is well-known for the quality of its products. This was a major factor in Sayyadinejad and Garg’s decisions to apply online at Sony’s website. In fact, Garg currently has two patents filed in her name. You can find more information about Sony Electronics at sony.com, and career opportunities at sonyjobs.com. Connect on Facebook, Twitter, Glassdoor, LinkedIn, Instagram and Tumblr. Lenovo is a multinational Chinese technology company with more than 50,000 employees worldwide and U.S. headquarters in Morrisville, NC. Its home office products for consumers include desktop computers, laptops, tablets and smartphones. Phoebe Thermitus is its director, data center group (DCG) operations. She progressed from software engineer through first-line manager to project manager to her current role as a director in April 2014. She used a career plan to identify short- and long-term career aspirations to help her move between roles, including stepping out of management for a few years. “After managing people for several years, I transitioned to a project management, individual contributor role, in order to broaden my understanding of how different components of the business fit together,” remembers Thermitus, who has a bachelor’s degree in science and mathematics, and a master’s degree in management. She expects the MBA she’s currently pursuing will help increase her business knowledge, expose her to more strategic thinking, accelerate her growth and enable her to increase her influence at Lenovo. Today, as she pursues her MBA, she leads a team of project managers who manage the end-to-end launch process for Lenovo’s data center products. “We’re responsible for leading cross-functional teams to launch products to market. We play a critical role in ensuring smooth operational excellence for delivering products and meeting business commitments,” she says. A particularly enjoyable aspect of her job is the chance she has to engage with different teams across the business and its geographical locations. Lenovo’s corporate culture, Thermitus explains, is built around a customer-centric framework, where the emphasis is on the customer and on building global team players committed to driving change and innovation. “By working in such a global environment, I’ve been exposed to different people with varying perspectives focused on a centralized purpose - helping our customers succeed,” she says. She adds that Lenovo is an example of a company that enables employees to experience different career opportunities, grow through formal or informal job assignments. It continuously innovates and focuses on being relevant in the marketplace. Since joining Lenovo, Thermitus had had several mentors - both informal and formal - that have helped her continue to grow and develop her career. She also participated in several education activities via the Grow@Lenovo, an integrated online platform that provides opportunities for development and capability-building for all Lenovo employees, as well as leadership development programs. Reflecting on her experiences, Thermitus emphasizes the importance of not being afraid, whether it’s when applying for a new position or executing in a current role. “When applying for new opportunities, a candidate shouldn’t limit their interest only to projects where they are 100% qualified, but look for opportunities that will foster career growth,” she advises. A reminder on her desk that asks, “What Would You Do If You Weren’t Afraid?” supports that philosophy. She advises younger engineers to seek a career that aligns with their interests while providing opportunities for growth. “Don’t limit your focus to current perspectives, establish and build a strong network, and be flexible so you can evolve throughout your career,” counsels Thermitus. Learn more about Lenovo at lenovo.com, and career opportunities at lenovocareers.com and linkedin.com/company/lenovo/jobs. Connect on Twitter, Facebook, Instagram, Pinterest, Flickr, LinkedIn, Google+ and YouTube. Amit Mehta is a computer science graduate from a university in India. He chose this discipline because of his personal interest in computers. During his undergraduate years, Mehta interned at an Indian cultural and educational institution, where he worked as a quality assurance (QA) engineer. Mehta went on to earn a master’s degree in marketing. His first contact with Plantronics - a Santa Cruz, CA-based American electronics company of almost 4,000 employees that produces audio communication equipment including wireless headphones - was on the company’s career website. From there Mehta was hired into his present position as a QA lab engineer, where he sets up and tests UC cloud-based soft phones. He adds that young engineers should never be afraid to apply for a job that has one or two skills they haven’t yet mastered. “You need to continue to learn on the job to make yourself a more effective and valuable engineer,” Mehta concludes. Find information about Plantronics and its open positions at www.plantronics.com. Connect on LinkedIn, Twitter, YouTube, Instagram and Facebook.